For lesbian, gay, bisexual, and transgender (LGBT) teens, acceptance can be challenging. A sense of community is critical to their well-being. 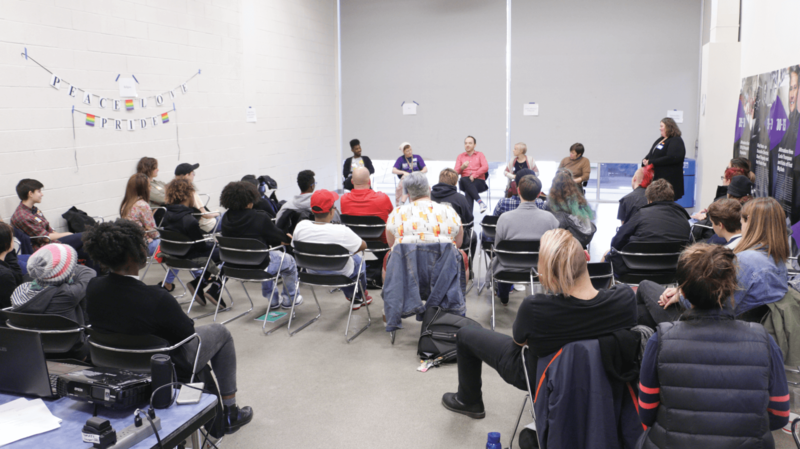 A recent Community Foundation HOPE Fund grant to The Neutral Zone in Ann Arbor supported an opportunity for LGBT youth to tell and share their stories. Established in 1994, The HOPE Fund was created to strengthen organizations and projects that support LGBT individuals and families in southeast Michigan. The Neutral Zone’s program promotes acceptance through storytelling and builds community among LGBT teens and Gay Straight Alliances (GSAs) throughout southeast Michigan. GSAs are middle- and high-school student-run organizations that provide safe places for students to meet, support each other, and talk about issues related to sexual orientation, gender identity, and expression. The Neutral Zone partnered with the Michigan Organization for Adolescent and Sexual Health (MOASH) on this digital storytelling project, with the goal of sharing stories widely with GSAs both in the area and statewide. A videographer from The Neutral Zone traveled with MOASH coaches to participating GSAs to capture student stories on video. In addition, a toolkit was created to support leadership training and provide dialogue strategies for students to use at their schools to continue participating in storytelling opportunities. The toolkit was distributed to all participating GSAs and is also available to anyone in Michigan who would like to use it to support teens across the state. The toolkit can be downloaded here: CFSEM.org/storytelling.